The Shooting Brake draws on styling cues introduced on the CLS. That styling is characterized by a long hood, narrow side windows, frameless window glass and a sloping, fastback roof line. The concept is pictured here. 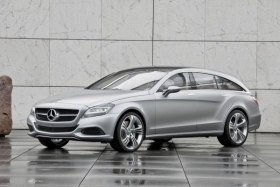 The Mercedes-Benz CLS Shooting Brake will be assembled at the automaker's plant in Sindelfingen, Germany. The vehicle is essentially a station wagon version of the CLS, Mercedes' coupe-styled sporty four-door. The Shooting Brake draws on styling cues introduced on the CLS. That styling is characterized by a long hood, narrow side windows, frameless window glass and a sloping, fastback roof line. 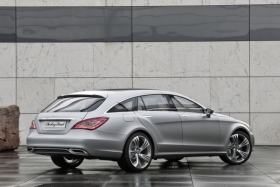 The Shooting Brake will be based on the redesigned CLS, which begins production in 2011. The Shooting Brake's gaping grille is a styling feature brought over from the SLS. "Break, or the homonym Brake, was the name once given to carriages used to 'break' in wild horses and also to restrict (or 'brake') their urge to move, so that they could be put to use as work horses. Since the carts could easily be broken as part of this process, people tended not to use ones which they may have urgently needed for other purposes. Where necessary, 'Brakes' were often fitted out with variable bodies, which were only really used to carry along anything that may have been necessary for the hunt, for example. Any such vehicle which was used when going out shooting was called a Shooting Brake or Shooting Break. In the 1960s and 1970s motorized Shooting Breaks were popular in Great Britain – exclusive cross-over vehicles, which combined the luxuriousness of a coupé with extended space on offer and additional variability."